A regressive reward system nearly takes the sheen off one of the most expansive, beautiful driving sims ever. I will play Forza Motorsport 7 for years, but I will never drive all of its 700-something cars. I won't drive every circuit under every possible weather condition, or during every night and day variation. I won't ever turn off all the driver-assists or know how to properly homologate vehicles on my own, which is an actual thing. Instead, I'll continue my quest to catch them all (the vans, specifically), tricking them out with anime liveries and critiquing their intricate dashboard designs. Forza Motorsport 7 is so vast and all-encompassing that not only can I turn it into a stupid game about vans, I can also make it a game about conquering my van obsession and finally learning how to drive cool sports cars. It's simultaneously a goofy car toybox and a semi-serious driving simulation. It'll rock your expensive wheel controllers to and fro and teach you about physics, inertia, and sweet shiny chrome. Or you can treat Forza like Mario Kart, bashing into every vehicle in your way. Just don't forget to admire the sunset (and avoid the puddles). Forza Motorsport’s PC debut marks it as the most feature-heavy and malleable of racing games—an elegant, gorgeous, accumulative work marred only by a regressive reward system and a few inconsistent performance problems. 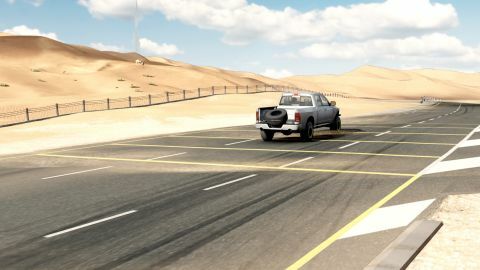 Within the first hour of play, I drove trailer trucks through the desert surrounding Dubai, drifted a limo through man-sized bowling pins, and raced the newest Audi RS LMS against a parade of earlier generations of itself. Each showcase event doles out silent lessons in how to go fast, more efficiently. The trailer trucks taught me that I really need to take my corners with care. Limo bowling taught me to brake and drift in even with the most unwieldy automobiles. The Audi race was a history lesson, a competitive car gallery that put technological progression and design in perspective. I appreciated every car, even as I blew by honking. And with the underpinning driving physics tweaked to near perfection over the course of seven games, Forza knows how to make a low-riding formula car feel volatile and sensitive versus the lumbering acceleration of a van or the pure efficiency and raw power of a Ferrari. Everything comes together in the Forza Driver's Cup, a massive campaign filled out with more traditional racing events designed to give you an abridged world tour through the history of automobile design and competition. It's a potent teaching tool for anyone with a modicum of car lust, carried forward by an impressive breadth of vehicle types, race configurations, and a car collecting macro game that might as well be Pokemon for steel cage enthusiasts. As you collect cars of a specific rarity, your collector score increases, and as you level the score up, new cars and the events they're attached to become available for purchase. I don't just feel the incentive to perform and complete every event—Forza encourages collecting every car and filling every space in a huge bingo card of 700-plus automobiles. Or you can be like me, and always swipe right on the vans. With the right PC and monitor, Forza looks downright incredible. Most of the locations are returning from Forza 6 and Forza 4, with Dubai as the only new setting. The upside is they're all augmented with 'dynamic weather' and time of day effects. It might start raining halfway through an endurance race, turning the back half of 23 laps into a game of dodging puddles in low visibility before giving way to a bright sunshine that turns the wet track into a blinding menace. My favorite are the night tracks though. They're truly dark, total blackness interrupted only by strings of headlights, inky ambiance, and if you're lucky, the gradual sunrise. Racing is no longer strictly a matter of finding a line and mastering corners—it's about learning how every vehicle handles in adverse conditions and reacting to those conditions on the fly. The simulation difficulty level is more challenging as a result, though anyone playing on the easier tiers will still have plenty to ogle at. First place has never been so pretty. And with the right PC and monitor, Forza looks downright incredible. Performance is improved over Forza Horizon 3, but this road is still a bumpy one. I've experienced three crashes while in the menus. On two machines running Nvidia GPUs, I noticed a good amount of stuttering in the pre- and post-race scenes and menus, but I haven't noticed the any issues while racing. I didn't get any stuttering in menus with an AMD GPU, and our early benchmarking reports suggest better performance on AMD GPUs overall. In its breadth, Forza sacrifices some depth. Pit stop animations aren't there; numbers just tick up as invisible power tools sound off. Opponent AI is awful in crowds, bumping into one another like lazy demolition derby. Players that strongly prefer a single vehicle class will hit a dead end quicker than most, running out of courses tailored specifically for open-wheel racing or vintage stock. Forza has never been the kind of sim a professional driver could train with. But for new players, a growing suite of driver-assists allow for gradual entry into the hot car bath. With options ranging from the new friction assist that equalizes tire grip on every surface, puddles and dirt included, to enabling or disabling a realistic damage model, finding your personal comfort zone is fairly easy. You're free to tweak them at will, but it might be a good idea to keep the ABS on if you're turning off the suggested line for the first time, or keep the rewind function around if you're thinking of turning friction assist off. With enough patience and the will to experiment, Forza has the toolset to take anyone from casual arcade racer to iRacing's front steps, officially a budding Car Person. It'll just take a bit more motivation in this version of Forza. Driver Gear is Forza 7's new token cosmetic, a driver avatar only ever spotted in brief glimpses through windows or between events. They're all over the damn menus though, a stiffly animated character with little purpose other than to make you feel like you've earned something. You can choose a gender and swap outfits, but that's it. I don't dislike their inclusion, but the drivers reflect a new design ethos that's completely desiccated Forza's traditional reward cycle. It was inevitable, but Forza also has loot boxes now. Prize Crates are available for purchase using CR, the in-game currency, and reward driver gear, player badges, cars, and mods, depending on how much CR you're willing to spend. Right now, they can't be purchased with real money and aren't required, but they're the only way to get mods, one of two ways to boost your CR earnings and fill out your car collection at a reasonable pace. You can equip three mods before a race to change the variables for CR gains, imposing weather conditions, removing driver assists, or guaranteeing small reward bumps. After a few uses, they're gone for good. With Turn 10's plan to introduce a new currency, purchasable using real money, the whole system takes on a troubling light. Mods and loot crates would be fine as an additional layer of incentives to inch your way towards a higher driving difficulty, but in previous Forza games as recent as Horizon 3, simply turning off individual driver assists boosted race rewards. Now, to get credits quickly you need to invest in prize crates, which get you mods, which get you more credits to get more mods, with any residuals going towards direct car purchases. Increasing the AI difficulty boosts CR earnings too, but racing more challenging opponents on a comfy driver-assisted plateau only encourages players to stay where they're at. With the new system, Turn 10 gutted the incentive for new players to improve along a natural curve, reducing rewards to random drops that place random conditions on a race with no attention to individual player learning. Prize Crates are an irritating blemish on the bodywork of an otherwise elegant series, but Forza is still formidable, even with this grabby monkey on its back. An uneven drip of credits don't make driving a '70 Chevelle in first person on a rainy track as the sun cracks through the clouds any less stunning. It's the songbird of cars, the sublime ocean cliffside filling the car poet with wonder and respect. Not much respect for time or skill, but respect for cars at least.